Wedding Receptions, Events, Sound Systems, YOU-DO-DJ Spokane, WA. Save Hundreds on Your Wedding Reception or Other Special Event! You-Do-DJ is the new way to party. More Fun! More Personal! We provide you with a professional DJ sound system and connect it to your laptop, iPod or other device so your personal music can be played. A microphone for announcements is included. We set up all the equipment prior to the event and then leave so you can enjoy your own private party. We come back at the end of the event and take everything down. We have done receptions all over Spokane and our service is recommended by many professionals in the wedding industry. We know you will be pleased. See testimonials from our happy clients. Professional DJ sound at a very low price. Your own music is played. We hope you will consider our service. Call or email for a no obligation price quote. 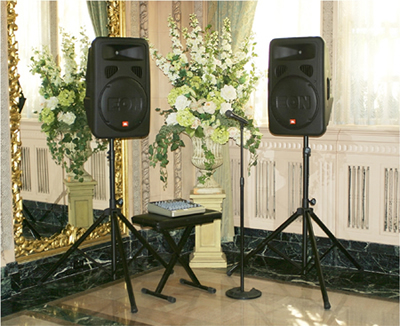 Do you need an audio system for your company party? Do you need a PA system for your wedding? Do you need audio equipment for background music at your corporate event? Here at You-Do-DJ we offer cost effective sound equipment, portable sound systems with high quality audio speakers, audio mixers and a host of DJ accessories including speaker stands, speaker cables, vocal microphones, wireless microphones, analogue mixers and stage monitor speakers. YOU - DO - DJ.